Everybody is familiar with the phrase “core training”. It has gained massive popularity since the onset of the 2000’s, and rightfully so. The ways in which a well-developed core contribute to your performance out on the ice are highly beneficial and multi-purposed. Although it is not just limited to performance, a well-developed core will also meaningfully decrease your risk of injury both on and off the ice by acting as a strong and stable shield for the pelvis and spine. To kick things off, it’s always important we first define what we are discussing before moving forward into the application of exercises for improved hockey performance so that we know what we are doing and why we are doing it. Here’s the thing, the average trainee usually limits the definition of the core to the rectus abdominis (anatomical term for what most people refer to as the “abs”) and the internal/external oblique’s, and the definition of having a “strong core” to having a visible set of 6-pack abs. Although a 6-pack can be a product of a well-developed core, it is by no means a direct indicator. It’s really just an indicator of low body fat percentage more than anything else. We all know the really skinny guy with a 6-pack who has never trained in his life. The reality of the core structure is that it is better defined as all of the musculature that attaches to the hips, pelvis, spine, and ribs. This is a lot of muscles to consider but when done provides a much clearer picture of how the core contributes to the totality of hockey performance. An example here can be brought upon by the rectus abdominis. Many people associate that muscle group alone with core function, yet their primary function is only spinal flexion (rounded the back and bending forward, kind of like a crunch). How dependent are hockey players on spinal flexion for maximal performance? Not very. The core encompasses flexion, extension, rotation, the absorption and transfer of forces, stability, potentiating mobility, etc. These core functions are the combined effort of properly sequenced firing musculature. The core should be looked at not in segments, but as one large functioning unit that depends on different components to communicate and fire properly to support and promote movement for the torso or to keep it stable during extreme forces. Think of stability during extreme forces like you bracing before getting checked, this is an automatic natural movement by the body to keep the spine stabilized and safe before contact. Keeping you safe and injury-free, although your bracing strength is limited by your core strength – so if you don’t have a lot of core strength and you get smashed, you could also be getting carried off the ice. 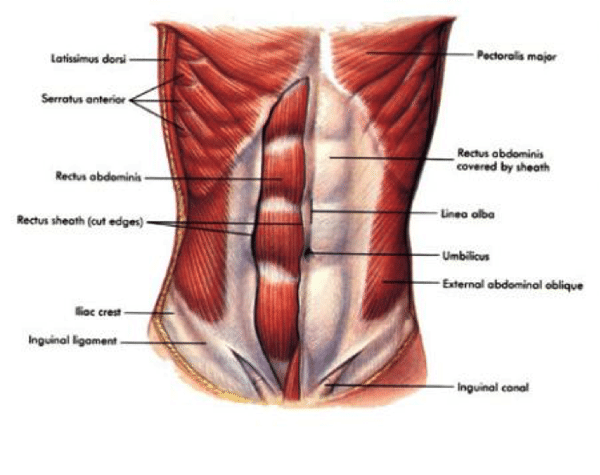 The inner core contains the diaphragm, transversus abdominis, multifidus, QL, and the muscles of the pelvic floor. This is where beginner athletes and/or trainees need to start if they have never done a real core training program before. 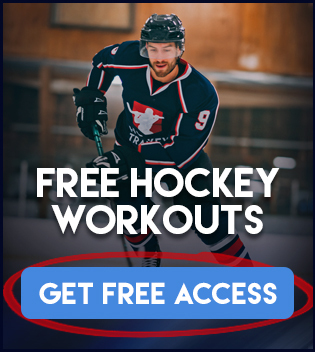 Even still, if you have done core work before, it’s probably a good idea to start here anyways with your program design to ensure that you really are covering all your bases because most people don’t even know how to pronounce those muscles — let alone train them in a hockey specific way. Why do we focus here first? Because the primary function of the inner core is to provide stability throughout all movement. Stability is a necessary component to athletic development because it allows you to remain stable throughout the unpredictable ranges of motion that the sport brings. Stability from the inner core works from all angles. 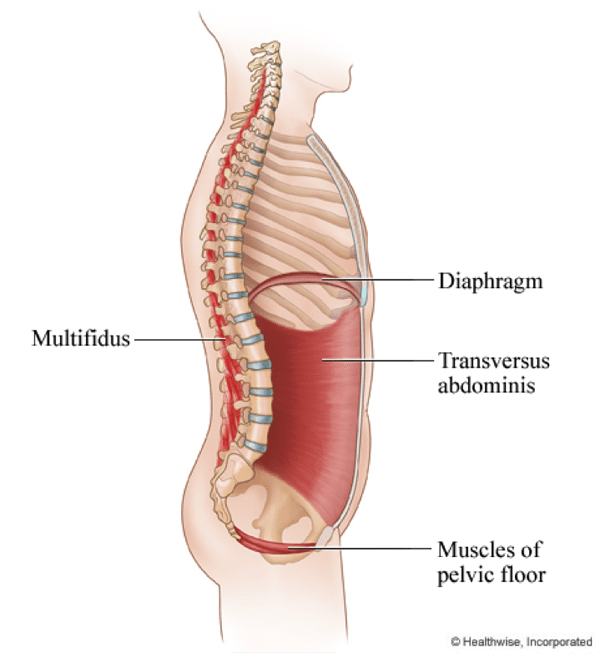 The diaphragm and the muscles of the pelvic floor work to stabilize from the top to the bottom (think from the bottom of the rib cage to the bottom of your pelvis) — and the multifidi and the transversus abdominis work to stabilize from front to back (think from your spine to your belly button). The QL, on the other hand, works primarily to stabilize the spine and is involved with both lateral flexion and anti-lateral flexion. You can think of the QL as a main spinal posture muscle for you. In any movement, these inner core muscles are always firing to keep your torso stable while you execute a task. It could be walking, running, skating, or playing the game of hockey. An example could be seen in the slap shot. If you’re feeling ambitious right now, stand up and mimic the motion of the slap shot without flexing or bracing your core whatsoever. Now, perform another slap shot motion while bracing/contracting your core throughout the movement. Bracing your core feels much more natural, doesn’t it? I can also bet you felt like you had much more stability in your body and rotational power going into that second shot. This is a good example showing that the inner core is always firing first during athletic movement not just to keep you stable for injury prevention, but also to keep you stable so you can create more force production. More on that later. The logical progression for core training is to first ensure proper strengthening of this inner-foundation before moving on to more advanced movements. The anterior core chain involves the much more familiar rectus abdominis, internal/external obliques, and the hip flexors. The combination of this musculature provides trunk flexion, anti-rotator force, rotator force, posterior pelvic tilt, hip flexion, and also provides solid structural protection of the inner-organs (which can come in handy during hockey). The anterior chain definitely plays its’ role in hockey performance due to its contribution in bracing the core and providing rotational power and strength. We have already discussed how bracing effects all movement in sports in this article (and also even more in-depth here), but this rotational power and strength found in anterior chain work has performance benefiting applicability to skating faster and improving your shot power. Only in times where you are completely under pressure and have less than a second to get the shot off (a rebound, for example) are the hands the only contributor to the power of that shot. All other times with all forms of shots there is rotation occurring within the core to maximally develop power within that shot. Stand up one more time with me (Last time I promise. OK, I don’t promise but stand up anyways) now try to perform a slap shot with zero rotation happening at all in your core. Your hips should remain motionless and pointing the same way the whole time and the upper body/shoulders should have no rotation. How much power do you feel was in that shot? Also, how ridiculous did you feel? Now perform a slap shot with solid contraction and good rotation in the core. I’m willing to bet you felt much more stable, powerful, and had a heck of a better wind up + follow through. This is how in a practical setting you can see the anterior portion of the core and how its rotational power potential can transfer into you scoring more goals. Rotational force development is HUGE for shot power potential. 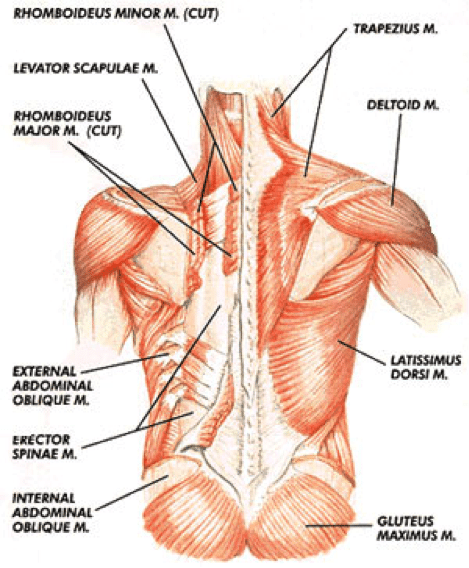 Here’s where a ton of people get lost in what the core truly is, they only ever think about the anterior portion. The posterior chain plays just as pivotal of a role as the anterior chain — and one without the other is an incomplete core structure. For optimal function in sports, structural balance of the core needs to be in place, and if you’re only focusing on your ab’s then you’re getting an isolated result. Isolated results aren’t ideal because the core should be viewed as one major functioning unit comprising of many muscles that need to be working together in unison, and not in isolation. Leave that stuff for the bodybuilders. The posterior chain stabilizes the efforts of the anterior chain, and it is these co-ordinated and controlled contractions that lead to moving correctly and with complete control. For you, that means moving with the greatest amount of energy efficiency on the ice. You absolutely cannot forget the posterior chain’s contribution to total core development and balance. You would be missing a huge part of what 360-degree core development truly is for athletes. 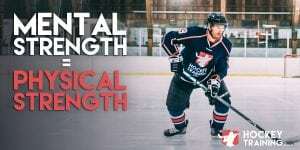 Posterior chain development in hockey players leads to greater shot power, greater strength, stronger stability on the ice so you don’t get knocked off the puck, and faster skating. Now that we have a more thorough working understanding of the movement and musculature involved in the core, we can talk a little more clearly about how the core works to meaningfully increase performance out on the ice. Functionally speaking, the core works to create stability across the torso, protect the spine, and potentiate force production out the extremities. But when we are solely talking about hockey performance, our focus becomes slightly more narrowed towards the cores ability to transfer ground reaction forces up through the kinetic chains we discussed and express that power. Put another way, power is created from the ground up. It is your core’s job to transfer this power from the ground through your arms so you can take the hardest slap shot possible. This power transfer is limited by how well-rounded (think inner/anterior/posterior) your core development is. Out on the ice, core strength is also vital for actions such as deceleration, high-velocity direction change, absorbing/redirecting forces, and energy economy. If the integrity of the core isn’t quite there yet, forces accumulated from the ground up can be emitted or dissipated through inefficient movement patterns affecting your overall energy economy and power output. Energy economy refers to the efficiency of movement. The more efficient you are at moving, the less energy you will expend performing those movements, which in turn improves your overall conditioning simply because you’re moving better. Think about the act of skating itself, forces are transmitted across the body from hip to opposite shoulder. When we skate, our body is working opposite from side to side to coordinate maximum forward speed. For example, if your right arm is forward, on the other side of your body your left leg is forward as well. Both pumping to keep you moving forward but keep you moving straight as well. This opposite-repetitive action drives forces across the body that are absolutely dependent on core integrity. This coordination is stabilizing your posture while allowing flexion and extension across both the lower and upper body simultaneously. A very clear demonstration of all three core units we discussed today working in unison in their most practical hockey form; skating. 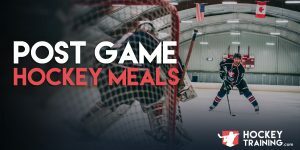 Hockey athletes will achieve their highest potential for speed and strength out on the ice with proper core development, provided other limiting factors aren’t at play such as mobility issues. Hockey players being both involved in a heavy contact sport and being strength/power athletes would benefit most from having a fully developed core from the inside out. This will translate to all athletic movement out on the ice. All of the above create fantastic stimulation of the inner and outer core systems and they also work various other muscle groups as well. Remember, the core stabilizes the spine. Think about how much spine strengthening stability is required (anterior, posterior, and laterally) to hold you in position during a well-executed heavy barbell row. As a general rule, if you’re new to the training game it’s wise to have a greater emphasis on building up your inner core stability first. Do this either on its own day or at the end of a practice or training session in the gym. Perform this 2-4x per week. As your strength progresses, we will start to get more advanced with the core training. Above are just two examples of core workouts you can include in your hockey training program. For a full hockey-specific core training program check out the Hockey Core Program. We have a series of core workouts that you can include at the end of training sessions or after hockey practice. Always keep in mind, the compound movements which should be in all of your training programs smash the core already plus a bunch of other muscles along with it. This means you needn’t add a “core only” exercise to address all forms of core movement. Many forms are covered very well through compound lifts that should already be present in your program design. What does that mean for your program design? Well, if you place core work before deadlifts for example, your deadlift strength potential could suffer because you have already done core work. This isn’t a wise strategy as deadlifts are a major movement and offer much more than just core development, so to pre-exhaust them with core work beforehand would be a defeating strategy. When incorporating any of the dozen+ isolation exercises I talked about in this article, it is always wise to hit them up at the end of the workout. At that point in time you will not be taking anything away from any other movement and yet still have the opportunity to smash your core. As a closing note, I also want to make clear that incorporating instability equipment to “engage the core” during movement is a poor strategy in almost all cases for hockey players looking to improve their strength, speed and stability out on the ice for the many reasons I went over in my last blog entry on why I don’t like hockey players training on unstable surfaces. If you’re interested in learning more about how to properly train for hockey visit our Hockey Training Programs page and pick up one of our programs. Feel free to share this with any hockey players you know, as that is the biggest compliment we can receive! Is it ok to train the core after speed training session (which included jumps, sprints and med.ball throws) by adding Ab wheel 4 x 8-10 with 60-90secs rest? Yes, this is 100% fine to do and something I have done with my athletes many times.